Finland Cricket Association also known as FCA governs all official cricketing activities in Finland. FCA organizes over 300 official matches throughout the year. FCA co-ordinates competitive cricket in 3 different formats . SM 40 Division(1,2,3) : Twenty20 and Indoor (10 Overs- Winter League). SM-40 Division(1,2,3)League and Twenty20 is played outdoor during summer between May-September , whilst Winter indoor league runs throughout the winter December-April. Not to forget FCA also introduced Hard-Tennis Ball cricket league throughout year 2014. Format: 40 Overs , League, Play each other home & away. Format: 30 Overs , Yet to conform league structure. Format: 20 Overs , Yet to conform league structure. Format: 10 Overs , League, Play each others once. 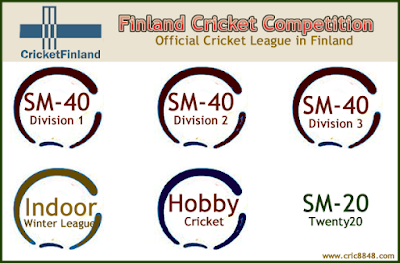 To get FCA tagged with your informal cricket events in Finland, all players in a team should register for a Hobby Valo License which costs Appx €15 annually per player per team. This hobby series can be played in any format at any time. Note: Players are not eligible to play above mentioned FCA League without a valid VALO LICENSE. For FCA League a valid A license is mandatory .Clcik here to choose right type of VALO LICENSE for you. Click here for winter indoor league fixtures and point tables. 10 Men Everest8848 Hurduled Stadin Krikettikerho in FCA DIV 3. SKK beat E8848 by 2 wickets in a Nail-Bitting Thriller.